Fawwara, into the Sun - watercolour on paper, 38 x 28 cm﻿s. 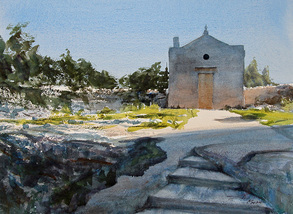 The Chapel of San Nikola and Santa Lucia, Siggiewi - watercolour on paper, 50 x 35 cms. Summer Shrub Burn - watercolour on paper, 50 x 18 cms. 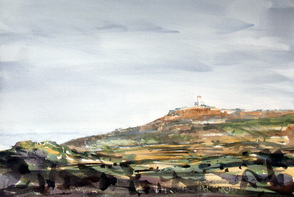 Tal-Giordan, Gozo, Malta - watercolour on paper, 50 x 35 cms. 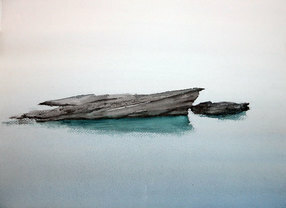 Since I had not seen Andrew Borg’s watercolours for some years I was stunned when recently I saw his latest works on his site http://www.andrewborg.com. The maturity reached by this artist is of very high level and the intensity of some of his works is amazing. I could not resist inviting myself to his studio to see his collection and the ambiance where he works. I felt terribly jealous. His studio bathes in light, space and atmosphere. Andrew is an intense person. He speaks with passion and conviction but with great humility. He bares his tribulations, doubts, passion and his urge which he experiences when painting. Some of his watercolours, which ooze chiaroscuro drama, caught my eyes, attention and spirit. How could I miss ‘Fawwara into the Sun’ or 'The Chapel of San Nikola and Santa Lucia, Siggiewi'. I love the way he manages to capture the glaring light, between the trees in the first mentioned, and the strident streak of light across the painting in the latter. His use of dry brush and wet in wet in the most appropriate measure is not easy to achieve. To cap it all he manages to achieve darks without becoming dirty or clumsy. Not an easy feat in watercolour! Not easy at all! This artist has now reached a stage where he can masterfully distil details and portray the essential strokes to convey maximum effect. This is essentially an evolutionary step, which an artist only achieves after much experience, practice, knowledge of the subject and courage to discard. This is what must have attracted the renowned Plein Air Magazine which spotted his 'Salib ta' l-Gholja, Siggiewi' and 'Tal-Hlas, Qormi' work on the internet and singled them out on http://www.outdoorpainter.com/why-this-works-simple-in-design-complex-in-execution/ and http://www.outdoorpainter.com/why-this-works-depicting-rain-slicked-surfaces/ . His simplicity in design yet complexity in the handling, the aerial perspective and sky transitional values have been singled out by this magazine. And I simply cannot react except with a heartfelt ‘Yeah! Yeah! 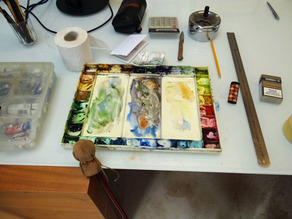 His palette is quite a limited one: burnt umber, yellow ochre, raw umber, ultramarine blue, cobalt blue, quinacridone purple and olive/sap green. He does resort to a couple of other colours but they are certainly not a constant. Andrew has gone through the early tough stages of pure academic design (which he still loves to show his visitors) and he rightly emphasises that the sharp eyes required for such preliminary work have helped him in no small measure to recall a scene in detail, and then decide to whittle all those details to the essentials. I must say, it is not merely his simplicity of execution which has hit me but also his daring choice of such simple, almost bare subjects such as Xrobb l-Ghagin. It takes a daring command of one’s capabilities to go for similar scenes. He also manages to extract a smile from me with his cheekiness in his work Summer Shrub Burn where the artist introduces in this vast expanse of countryside, a bonfire (no use of white but picked-up colour) which emits smoke that covers what other artists would have considered the main attraction of the scene, namely Mdina in the distant horizon. I can hear Andrew Borg say: What the hell! I have painted Mdina a thousand times. Let the smoke reign for once! Andrew utilises the paper’s potentiality to its limit: its crevices to allow maximum granulation, its absorbency to soften outlines, its power to allow picking up of colour etc. I can see Singer Sargent’s influence in some of his works (and I say this as a compliment). I definitely admire the way he has managed to localise some of these effects to reach a Maltese fluency in Tal-Giordan, Gozo. But otherwise, Andrew Borg works with a mind of his own, with a determination to explore and learn more every single day, and with a passion which is bound to translate itself in his beautiful watercolours. Andrew Borg’s work is undoubtedly of very high standard and I certainly look forward to more experiments, experiences and expressions which this artist can regale us with in the future. My recent plein-air watercolour painting, Siggiewi Panorama, has been hand-picked and featured in the leading international plein-air magazine, OutdoorPainter.com. Click on the image on the right for the full feature. Jeanne Mackenzie is a Colorado resident living in the Fort Collins area where she is one of the founding members of the Rocky Mountain Plein Air Painters. Graduating with a Bachelor of Fine Arts and Teaching Credential from San Diego State University, she also studied with Clyde Aspevig, Michael Lynch, Matt Smith and Calvin Liang. Her paintings are featured in several fine art galleries in Colorado, California and Arizona. Jeanne has been featured in Southwest Art Magazine’s Best of the West and My World, American Artist’s Workshop Magazine, Plein Air Magazine and International Artist Magazine-Master Artists. She is a contributing reviewer with Plein Air Magazine - outdoorpainter.com. When life on home-soil invariably gets the better of you, there is nothing sweeter than the editing of your life in a set of luggage; the waiting experience full of promises at the airport; and the smell of foreign air and alien sights or sounds. And with the world made smaller thanks to low-cost flights, easy connection options and alluring, far-flung ad campaigns, how can foreign and beautiful cultures be ignored? Artists often travel as a means of inspiration. Artist Andrew Borg (b. 1964) is relatively new to the local art scene, having begun his artistic career some three years ago. Currently he uses watercolour almost exclusively, a technique he is drawn to because of the discipline it requires. Borg's pieces are largely inspired by aesthetics; he enjoys painting what looks food at the time, and his influences come from the likes of John Singer Sargent, Edward Seago and Trevor Chamberlain, all master of the watercolour medium. Borg is intrigued by capturing interesting shapes, tonalities and moods from an off-beat angle and any source of these facets would be enough to tempt him towards painting; he finds joy in searching for unusual subjects in his travels. But all the while location seems to be not that important for Borg, and he takes his pleasure from choosing a well-worked subject and transforming it through a fascinating angle whether by way of composition, perspective or mood. His watercolour-on-paper entitled 'Tour Eiffel' is one example of this. The heavy, dark iron girders towards he top of the painting are supported by a light square to make the whole structure look unbalanced, light and fragile. The economical use of watercolour for the structure and foreground makes the painting feel quasi-impressionistic. Borg largely chooses watercolour due to its immediacy but also reels in the challenges it presents. When using this medium it is important to eagerly plan the composition and lighting to ensure that the result is not pale and limpid. In fact Borg's pieces appear dark in colour and imposing in detail The painting entitled 'Il Duomo' is a dark, detailed and impassioned snapshot of his travels in Italy and his brush captures the light shining on the marble statue with various, indirect reflection; he also manages to commander the translucency of the marble itself while focusing his detail on the statue itself. The remainder is done very loosely, merely supporting the main subject. I'm sure that if one dug deep enough one could find some things to accuse Andrew Borg of, but being run-of the-mill is certainly not one of them. Ever the chameleon artist, Mr Borg has always surprised art lovers by his facility to switch from one style and medium to another and his latest exhibition at Gallery G is no exception. While Mr Borg's theme remains landscapes, the few traditional pieces have lost their echo of John Martin Borg's style, as Mr Borg establishes a more personal style, seen in his views from Rabat's Saqqajja overlooking the valley beneath, shrouded in early-morning mist. However, his signature landscapes remain his aerial views and industrial scenes. This exhibition also launches a new side to Mr Borg, his "pleine air" paintings, as he has joined the growing regiment of landscape painters who meet weekly to paint the wonderful gems that our landscape surprisingly still holds. This loose and colourful style was not previously seen in his work and what these cheerful pieces lack in precision and tonal work, they make up for in spontaneity and boldness. 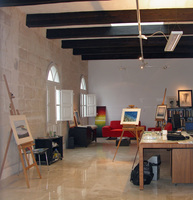 A new theme for the artist is Malta's heritage architecture, represented by a set of Valletta scenes. Meticulously worked, these paintings are on the opposite end of the spectrum to the on-site paintings; while they lack that bold touch, Mr Borg always manages to catch a unique angle, that overlooked corner of even the most over-worked scene, a talent that gives his painting that unique touch. Whether it is Our Lady of Victories church, one of the Palace Square fountains, or Queen Victoria ruling imperiously over her pigeons (or is it the other way round?) Mr Borg gives the viewer a reason to revisit these familiar scenes. Still, he is not content, taking his urge to give a quirky and thought-provoking twist to his works one step further. In What Am I Going To Do With You, Ghid?, Mr Borg places the words so often spoken by despairing mothers, in the mouth of a female figure looking down on the Maltese archipelago from a high promontory. The woman seems bowed and heavy-hearted, echoing the withered and bent tree behind her. Malta and Gozo seem to bask in an idyllic sea, but on closer scrutiny, what are those plumes of brown sludge flowing out of Gozo? This theme of things not being what they seem to be is picked up again in Inti Gej, Jew? - an arresting night scene of some ancient ruins by a luminous sea, a masterful, almost monochrome work, seems just that, a beautiful moonlit scene, until one spots a mysterious female figure in an evening dress, pining among the ruins. Reflections On A Monday Morning is another teaser. Who is the joker on the back of the garbage truck in full jester garb? Where is it set? The truck looks shabby enough to be Malta but the buildings look tall enough to be New York? Is Mr Borg trying to tell us something? No doubt, but it's up to us to find the answers. Mr Borg may not be a heavyweight among artists, but neither is he content to present superficial chocolate-box landscapes which could come so easily to him, a fact which has no doubt contributed in no small measure to the success of this exhibition. For those who are toying on whether to take up art or not, Andrew Borg is definitely a great inspiration... he studied engineering both here and abroad, is involved in directing a successful IT company got married and had two kids before he took his art ‘seriously’. But it’s that 40 years of life experience that has driven him towards his art and place him at the top of Malta’s A list of local artists. A man who likes the simple things in life, he is less interested in showing his face and more in sharing his art. His first ever solo art exhibition entitled Impressions opened to the public yesterday and will run till the end of the month at Gallery G (No. 4 Sir Ugo Mifsud Street, Lija). His late arrival on the art scene (although if he’s totally honest he’s ‘dabbled’ since he was a teenager) meant an acceleration in the learning process, immense focus and lots of practice. “Technique is a scientific process: a look–memorise–draw process that one has to coordinate with motor control of the hands. Add a good dose of perseverance, practice... and manage the frustrations. Like the experience of learning a musical instrument,” says Andrew. The artist’s first ever exhibition was held at the collective Gallery G ‘New Faces 2006’ event which he describes as being an “exhilarating experience”. Following that he participated in a number of collective exhibitions, including one at Camilleri Paris Mode, the Girgenti Open Day Exhibition, OperArt 2007 at the Manoel Theatre and the San Anton Palace Gardens Open Day Exhibition. Impressions is a collection of his 70 plus watercolour paintings, all created within the last year. Subjects including portrait, figure, industrial, city scapes, panoramas, stone structures and some surrealistic works too. Are there any artists he particularly admires? “Currently it is the American painter (born in Florence) John Singer Sargent.” Sargent was known to be extremely bright, gifted, an intense hard worker, Sargent mastered many different painting styles. He was an impressionist, a classical portraitist, a landscape artist, a water colorist, a muralist of public art, and even started sculpting in the last years of his life. Locally (besides those in the plein–air art group) he enjoys works by George Fenech, Joe Bellia, Lawrence Buttigieg, Noel Galea Bason, Antonio Sciortino, Edward Caruana Dingli, Giuseppe Arcidiacono and Anton Calleja. And I’m sure many local artists now list Andrew Borg as one of their favourite artists too. In their most recent exhibition currently running at their Sliema shop, Camilleri Paris Mode have certainly kept their word of bringing us promising new talent. This month’s new face, Andrew Borg, was teamed up with Antoine Paul Camilleri, an artist who is not new to the scene, but possibly lacking in exposure, so his works were a similarly pleasant revelation to many. Borg’s impact on the exhibition viewers was in inverse proportion to his profile. Questions of ‘who is this artist?” were met by a very low-key, affable artist who only recently started churning out works with a talent that can only be described as God-given. Although he would be the first to declare that there is room for improvement, Borg’s mastery of composition, colour, and the very medium of watercolour belies the fact that he has only been working seriously at his art for the last 18 months. 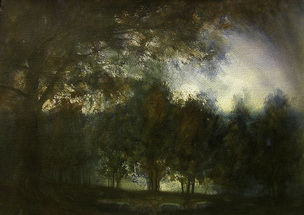 Borg claims that it was the challenge of watercolour that attracted him to it in preference to other media he has tried. However the mastery of watercolours does not seem to have been satisfaction enough. Borg is a chameleon artist and his various works show that different styles come easy to him. While the influence of his mentor, John Martin Borg, can clearly be seen in some of his brooding landscapes, others are more vibrant. Such a one is he rich-hued ‘Narrow Street at Cefalu’ a where the depth of the picture is enhanced by Borg’s play of light and shade, while one can practically touch the bricks stripped of their crumbing stucco. Borg attributes the looser, more impressionistic style of paintings like ‘Breakwater’ to the influence of Edward Seago, though the soft Mediterranean light and wash-out hues give it a very Maltese/Gianni appeal. Starkly different are his‘industrial’ scenes, where Borg’s eye for colour and line pulls off unsympathetic subjects like tankers and dockyard cranes. Borg’s eye catches the angle that other artists might miss, strange subjects they might not tackle and yet does not disdain the post-card prettiness of ‘Niche near Girgenti’. Stark and dramatic in ‘Dead Tree’, impressionistic and highly enigmatic in ‘Panic in the Cathedral’ and ‘Go West’ with its shades of Tienammen, or daring us to confront the unspoken suffering of ‘Kristu’ in a way we’ve never seen it before. . . this is one artist who will not be pigeon-holed, one to watch. While Borg’s works are bewildering in their variety, the works exhibited by Antoine Paul Camilleri are far more self-contained, all things that are fond and familiar in life. His references to his celebrated artist father and his childhood abound as much in his work as in his conversation, where talk of the ready availability of clay and other materials in his childhood home account for his talent in both handling and incorporating different media. Camilleri’s paintings are a fascinating combination of his twin loves of line and colour. Enamoured of architectural forms when his family moved to Valletta, Camillleri’s paintings are mostly town or village-scapes, and it amazes one to hear that they start as pen drawing and often are only painted-in years later. For this reason they have a very strong graphic appeal to them, while the time-lapse before applying colour permits Camilleri an interpretation that is often totally detached from reality, such as the appealing harmony of pinks, blues and mauves in ‘Valletta Rooftops’. The debate of supremacy of line over colour and vice-versa is one that has been going on since time immemorial, and this approach may be Camilleri’s personal answer. Admittedly I find that where he chooses to leave a part of the paper bare of colour in order to show the beauty of pure line, it can tend to compete for attention with the painted section, rather than complementing it, however there is no arguing his mastery of both line and colour harmonies. Love of family again dominates in Camilleri’s sculptures which obviously draw their inspiration from his two daughters. ‘Children on Swing’ and ‘On the Slide’, are both celebrations of childhood innocence, however there is nothing childish in their technique, as their level of detail would be a casting nightmare for all but the most proficient of sculptors. Camilleri’s choice to cast his clay children and ballet dancers in resin mixed with bronze powder marries well with his integration of metal structures in his sculptures, giving his ‘domestic’ subjects that essential harder edge. In a country that can now boast of plenty of good painters, good ceramists are still rare, and it is maybe for that reason that Camilleri’s glazed ceramic sculptures were the most remarked of his works. Seemingly effortlessly, Camilleri recreates scenes that we can all relate to; a pinch of a workman’s face, a bottle on the side of a ‘bowser’, the arm hanging out of the truck-drivers’ window, all speak volumes to our Maltese psyches. ‘Pieces like Off to Work’ and‘Tal-Pitrolju’ are not just sculptures but works of art that double as records of our time; a pleasure to look at, a privilege to own.